Installing a messaging app for your organization can be beneficial in plenty of ways. In general, a messaging app can help people work efficiently while staying in consistent communication. To deploy a professional messaging application in a larger organization, you won’t need to ask everyone in your company to manually install the application on each computer. You can push the app across your organization just like you can install any other set of applications all at the same time to multiple computers. 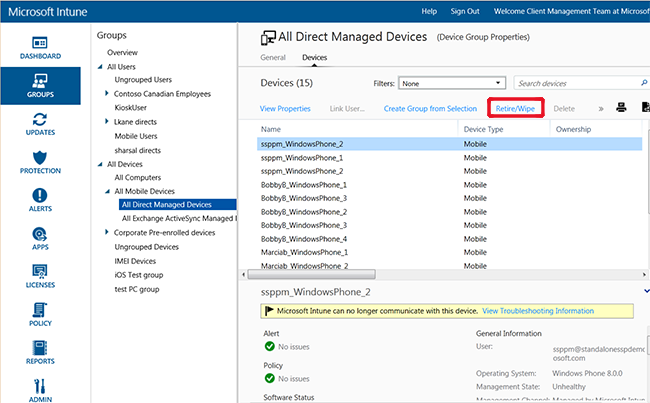 Let's take a look at Microsoft Intune as an example With Intune it is now easier to securely manage all devices and applications that are a part of your organization. Intune works on a variety of devices and operating systems apart from Windows including Android, iOS, and OS X, so it will be easy to install throughout all company devices. Deploying software with Intune takes a couple of steps for the IT team, but could save your business a lot of time in the long run — this is especially the case if you work at a larger organization. 1. Once you setup your business account for Microsoft Intune and connect it to your company network, you’ll be able to manage the devices and applications as an admin. In the Intune administrator console, you can create groups to organize users and devices beforehand. 2. When you are at the Intune administrator console, select Apps > Apps to start the process of publishing the app for availability. Intune allows you to use external links from application stores. For Windows and Mac computers, you can find the direct links at the following app stores. You can also use the direct links from mobile application stores to deploy Team.biz for mobile. 4. When you deploy an application, you can choose from a variety of actions. Required install means that the application will be automatically installed on the device. Available install allows users to install it from the company portal. It's important to keep this in mind for users when deploying the messaging platform. 5. To start deploying the messaging platform, select Apps > Apps from the main admin console. Clicking Manage Deployment initiates deploying the app. Group Policy is another method of deploying applications and is used primarily on older versions of Windows. If you'd like to deploy Team.biz across your organization using a 32-bit or 64-bit MSI, you can find the files here. If your organization uses Mac the MacOS alternative to Microsoft Intune is Apple DEP (Device Enrollment Program) which can help with easily deploying and managing iOS and OS X devices.